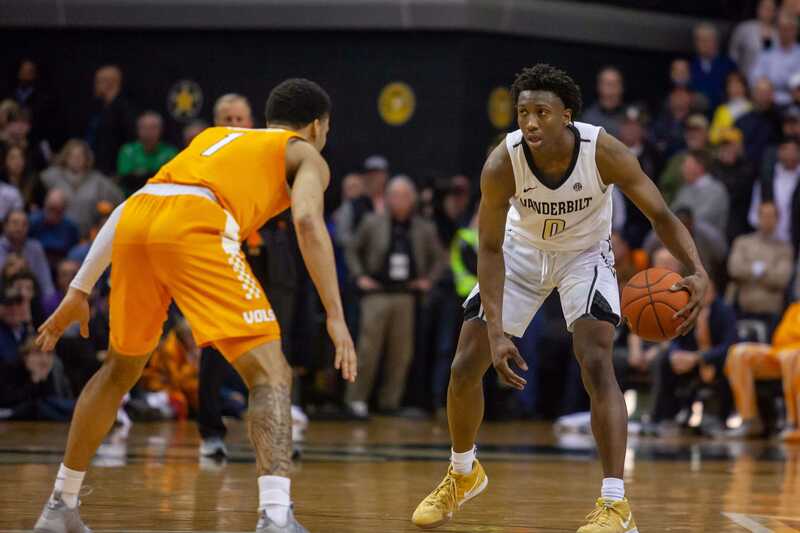 Vanderbilt falls to Tennessee 88-83 in Memorial Gymnasium on January 23, 2019. Photo by Madison Lindeman. Everything but the final score felt like 2008. When guard Saben Lee drilled a three-pointer to put the Vanderbilt Commodores up 70-65 on the #1 Tennessee Volunteers with 3:48 remaining , the roar of Memorial Gym was reminiscent of the days of Shan Foster and Derrick Byars, and the atmosphere on the day that Vanderbilt took down then-#1 Tennessee in February 2008. Just over a minute later, when Clevon Brown threw down a dunk to put Vanderbilt up 74-70, it felt like it was Festus Ezeli throwing it down in front of a raucous and rowdy Memorial crowd. Despite coming painfully close to pulling off a dramatic upset over that team from Knoxville, the Commodores, and head coach Bryce Drew’s budding rebirth of Vanderbilt Basketball culture, took a leap forward on Wednesday night. It helped to have the backing of a classic Memorial crowd. The atmosphere in Memorial Gym was electric despite the team’s recent struggles, and the crowd brought a heavy dose of noise and energy despite ample Volunteer fans in the building. In addition, the Commodore players went toe-to-toe with the top-ranked team in the country and put in an effort that would likely be good enough to beat most other teams in the country. Vanderbilt’s offense took the biggest leap tonight, as shots that seemingly wouldn’t fall through the first five SEC games started going in. The Commodores shot 50% from the field and 47.6% from three-point range. Overall, they were 61.9% from the foul line too. They made a lot of plays that they needed to make down the stretch, and played Tennessee evenly. But if you play a team like Tennessee evenly, you’re still going to lose. The emotions of coming so close to pulling off the impossible were raw, but this team thinks it will help them grow up. Nesmith also continued his season-long emergence as a star and a leader with a 24-point night and countless contributions on both sides of the floor, including a LeBron James-style chasedown block that helped force overtime. He even earned praise from Tennessee head coach Rick Barnes for his emotion and his fire in this game. Now that Vanderbilt has had its growing pains and gone through the pain and heartbreak of this game, the hard part begins. The Commodores have to find the passion and the intensity that they had tonight and bring it in every other game going forward. They have to find the offensive rhythm to make shots consistently rather than in bunches. And the student section should bring that same energy night in and night out too. Vanderbilt’s next home game is against Kentucky, a team that Vanderbilt should be chomping at the bit to beat, on Tuesday. We’ll see if the Magic was back in town for one night only or for a new permanent residency.